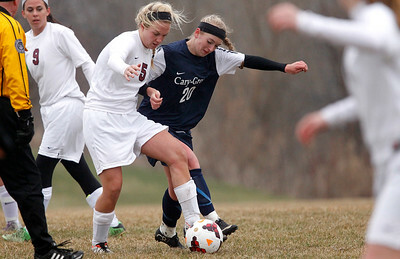 Matthew Apgar - mapgar@shawmedia.com Prairie Ridge's Cassie Warton, left, and Jenni Phillips of Cary-Grove battle for control of the ball during the second half of their girls soccer game on Tuesday, April 7, 2015 at Prairie Ridge High School in Crystal Lake. Matthew Apgar - mapgar@shawmedia.com Emma Baker of Cary-Grove, left, and Gabrielle Fanning of Prairie Ridge jump up for the header during first half of their girls soccer game on Tuesday, April 7, 2015 at Prairie Ridge High School in Crystal Lake. Matthew Apgar - mapgar@shawmedia.com Prairie Ridge's Cassie Warton, left, hugs teammate Arielis Reyes after Reyes tied the game up at 1 goal each during the first half of their girls soccer game against Cary1Grove on Tuesday, April 7, 2015 at Prairie Ridge High School in Crystal Lake. 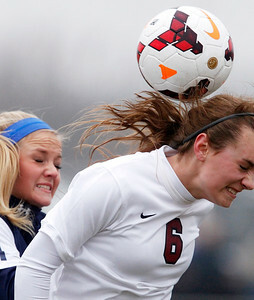 Matthew Apgar - mapgar@shawmedia.com Emma Baker of Cary-Grove, left, challenges Halle Simons of Prairie Ridge for the header during the first half of their girls soccer game on Tuesday, April 7, 2015 at Prairie Ridge High School in Crystal Lake. Simons connected with the ball with under a minute to play in the first half, knocking it into Prairie Ridge's own goal to give Cary-Grove a 2-1 lead heading into the second half. 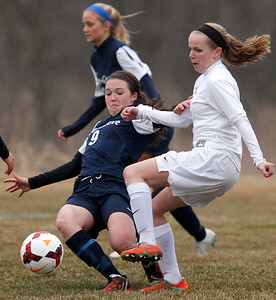 Matthew Apgar - mapgar@shawmedia.com Teagan Jones of Cary-Grove, left, slides to kick the ball while behind challenged by Jena Berkland of Prairie Ridge during the second half of their girls soccer game on Tuesday, April 7, 2015 at Prairie Ridge High School in Crystal Lake. 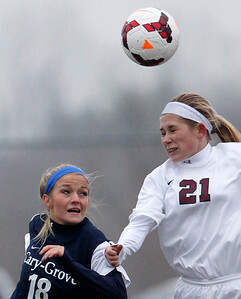 Emma Baker of Cary-Grove, left, and Gabrielle Fanning of Prairie Ridge jump up for the header during first half of their girls soccer game on Tuesday, April 7, 2015 at Prairie Ridge High School in Crystal Lake.